Britain's most violent prisoner indeed! I have wanted to watch this for a long time and after my streaming service suggested it to me I finally got around to it, and I am glad that I did! At first I thought that this was an odd movie and hardly worth the time, but after maybe 20 minutes it started growing on me and shortly after I could not wait to see what Charlie was going to do next. I was very impressed by the performance of Tom Hardy. As the movie features mostly him, the demands for a good performance was high, and in my opinion he delivered what was needed. Well done! It is hard to label the mental state/illness of Charlie. To my knowledge he is not a psychopath, and not even a sociopath. He is not evil and does not want to maim or kill people, he just wants to be famous. However hi way of getting there does hint some kind of dysfunctional social behaviour. My favorite part of this movie is when Charlie and the prison warden negotiates the terms for releasing the librarian Charlie has taken prisoner. I will not spoil it by quoting the dialogue, but I was sitting by myself laughing out loud when I saw it. refreshing humor in a sombre movie. 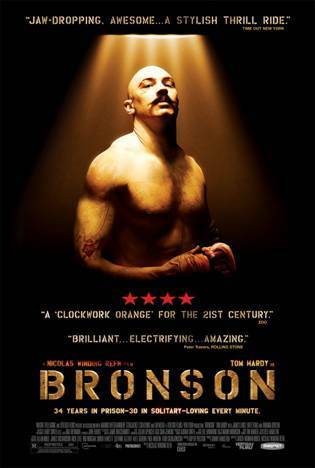 Watch this if you are into movies with large brawls, movies about strong yet mentally challenged characters, movies about different prisons in Britain or just like a good fight. After I have seen it, I would characterize it as a one-to-watch movie in my book.